Ramona's Voices: Eyes on the Prize, Occupiers. The 99-Percenters are counting on you. Eyes on the Prize, Occupiers. The 99-Percenters are counting on you. For a couple of months now, we on the left have been marking the heady, exhilarating, organic spread of the Occupy Wall Street Movement and getting it that something unstoppable seems to be happening. Think of it: The dedication, the precision, the impossible successes coming from a movement organized by ordinary hoi polloi. No backing by agenda-driven billionaires, no pseudo-intellectual input from think-tanks, no take-over by shady cabals. It's the stuff of miracles. It's the kind of citizen-driven wildfire effort we haven't seen in this country since the days of the Civil Rights Movement. Just as the march on Selma was the catalyst for a nationwide awakening to the need to end the rampant, blatant, often lethal, civil rights abuses in the South, the occupation of Wall Street woke us up to the possibility that change could come to the poor and middle classes suffering from decades of ruthless economic abuses perpetrated by the power brokers. As we already know from past history, change of this magnitude takes vast crowds of hopelessly burdened people finally coming to the end of their patience, finally committing to a cause so essential to their well-being the only acceptable outcome is success. It takes crowds so huge they can't be ignored. Crowds, in this case, not just on Wall Street but spread across the country in every city, every town, every public square. When ordinary Wisconsin citizens stormed the State House in Madison in the dead of winter early this year to protest the attempted theft of their bargaining rights, the die was cast. They overtook the castle and they stayed. Their occupation of the Peoples' House opened doors to those in other beleaguered states--Michigan, Indiana, Ohio--and when attention had to be paid, when concessions, however slight, were made; when recalls were threatened and then carried out, it was like manna to a starving nation. It energized us all. But there comes a point when every such movement goes from simmer to a rolling boil, requiring an ever-watchful eye in order to prevent it from spilling over and ruining the entire project. With the OWS movement, it was only a matter of time before the cops would get pushy, before the city fathers would lose patience, before the opportunists with agendas of their own would infiltrate. Past history dictates that much of the purity of any grand movement will be lost to influences beyond the movement's control. The ones that succeed are ready for whatever comes and take steps to move past it. They succeed because they never take their eyes off the prize. 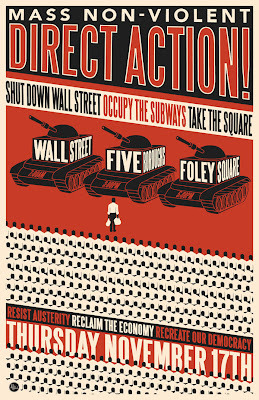 Huge movements like these -- Civil Rights, anti-Vietnam War, OWS -- begin with and are sustained by a red hot anger. It takes a hefty resolve on the parts of many to keep the anger laser-beamed to the source without allowing it to resort to the kind of rage that turns violent. It's an uphill battle, never made easier by time. As the days and months go by without some kind of resolution, one side or the other is going to blow. It happened in Oakland last week after a month-long confrontation with police. Increasingly, we're seeing police in riot gear, warranted or not. Rubber bullets, tear gas and pepper spray are the weapons du jour. Different factions are losing patience and are disrupting Occupy meetings, even when the organizers are on their side, as happened in Seattle with the "mic check" shout-out. Winter is coming and the Movement is in danger of losing momentum. Freezing temperatures will empty parks and squares within weeks and much of the activity will be moving indoors, out of sight. It can't come soon enough for a host of mayors, including NYC's Mayor Bloomberg, who held a presser this AM announcing the plan to get the protesters out of Zuccotti Park so that crews can give it a good cleaning. He took the opportunity to announce also that, while he's a big supporter of First Amendment rights, he won't be allowing overnighters at Zuccotti anymore. Before the presser, the police were taking box cutters to the tents and arresting protesters who had been lulled into thinking it was okay to just hang around for a while. A court order, issued soon after Bloomberg spoke, rescinded his actions, giving the use of the park back to the OWS bunch. Bloomberg's office says they'll go back to court. For now, Zuccotti Park is empty and any clear vision of the First Amendment is muddied once again. Update: The park is open but no more camping. No more tents. Sometimes you take your victories in smaller doses than you had hoped. Onward. So where do the Occupiers go from here? Protesting in parks and on the sidewalks outside buildings, carrying predictable signs, remaining lawful within established confines -- is that all there is? How long before those efforts become ho-hum and easily ignored? Is it time now? Is this the point where the actual revolution begins? 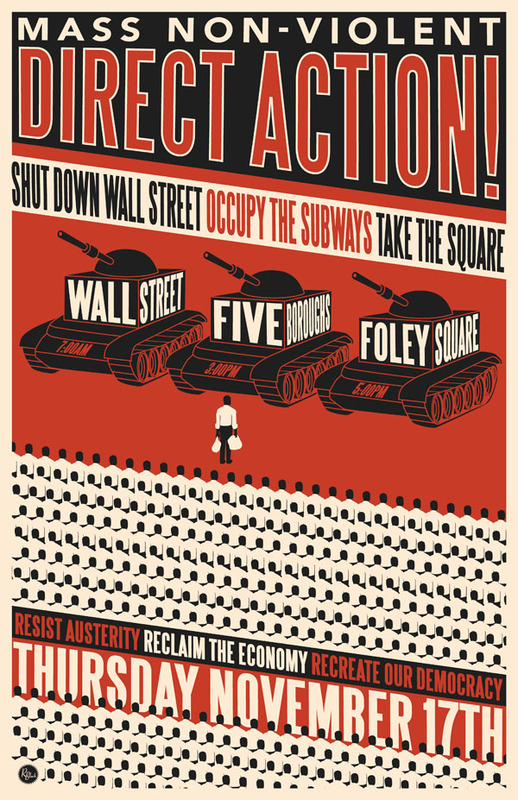 Occupy Wall Street is planning a MASS NON-VIOLENT DIRECT ACTION on Thursday,. November 17. It's the next step for them and, as with any step forward in the revolutionary process, it's not without its risks. Poster by R Black. Can be used freely, but cannot be sold. So where will they go from here? Are there real Anarchists out there? Infiltrators? If so, how many? How are they when it comes to stamina? Will violence erupt? Will wiser heads prevail? Will a clear leader emerge? What will it take for this Movement to succeed? Every report of infighting (and there is and always will be infighting), every report of concerted efforts by detractors (and there are and always will be detractors) needs to be offset by reports of solid consequential successes. Every move needs to be shining a spotlight on the goal. The goal is to rescue the country from the One Percenters and their enablers so that we can revive it and rebuild it. Anything else is ineffective, unproductive diversion, of no good use to the 99 percent who are finally beginning to see that change they can believe in is not only possible but probable. What cruelty if, after all this, we veer off and let ourselves down.